These polymer pearls are created by simply adding water and can hold 100 times their weight in water! This causes the water absorbent beads to expand into perfect miniature spheres. 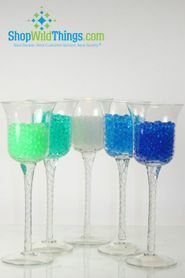 Use them to add some extra color to your decorating scheme, centerpiece, candlescape, floral arrangement etc. Use separately or mix colors in one vase for a stellar effect! Water pearls are reusable and will fit down the smallest vase openings (i.e. tower vases) Non-toxic and biodegradable. 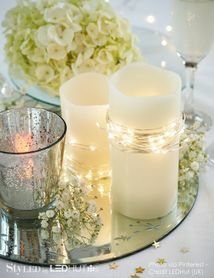 These items are excellent for vases and work extremely well with our LED Submersible Lighting! You'll be able to make about 14 gallons of pearls! Our small jelly pearls measure about 1/2" (10mm) when filled with water! They make quite a beautiful statement! Click Here to buy Large Beads water pearls in a smaller quantity for $8.99. Many colors are available. Click Here to buy this Small Size water pearls in a smaller quantity for $8.99. Many colors are available. - You can dry them out and re-hydrate them up to 6 times! Just store in a plastic bag! If they never completely dry out, they will last for years. 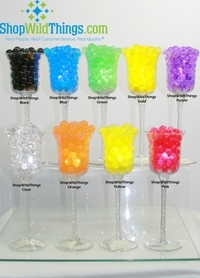 - When using the CLEAR color balls, you can add some food coloring and make them any color you'd like! Or, add our Acolyte Submersible LED lights for easy color change and no mess! The SMALL beads will grow to be 10mm (about 1/2"). DO NOT flush down the drain! These WILL re-hydrate and clog up your plumbing. Because they are biodegradeable, if you are finished with them, simply throw them in the trash. Or instead of throwing them out, consider putting them in your dirt at home to hydrate your plants. Lasts up to 2 Years! I personally (Katie from ShopWildThings) have 3 bamboo plants at home growing exclusively in Water Pearls. They have been growing using the SAME BEADS for 2 years. I just add water when the beads get a little dehydrated (they get smaller)...and that's it! Instructions for use: 1. Distribute packet of polymer beads water. (For best results, use distilled water) 2. Allow the beads to expand fully for about 6-8 hours, generally it is best to do this overnight BEFORE your event. 3. Drain out excess water from vessel. 4. Pour into desired container(s). 5. 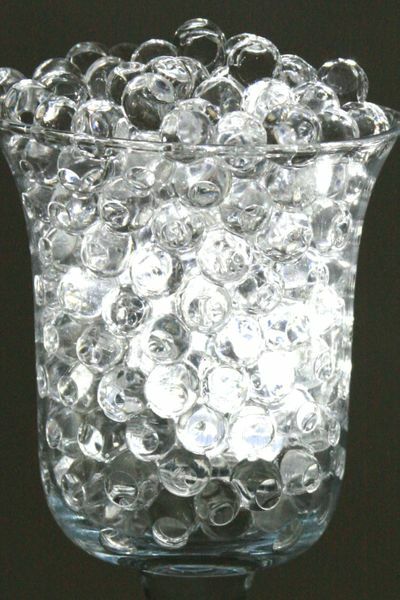 (Optional) Use our LED decorative accent lighting to get a elegant glow effect from inside the water pearls. Consum...they bounce really really well and really really a lot and are hard to catch!! These were the perfect touch for our corporate event! I would definitely use them again. Great variety, quick service and priced right. I placed an order early 2012 for our wedding in May of that year. 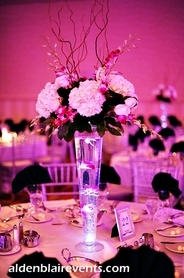 We used the clear & black water crystals to fill up 30+ tables for the 350+ guest that joined us that night including vases at the entrance & our table of course. We managed to still have some left overs. After wards the kids of all ages including my brother had a ball using it in the their hotel room (teenage brother & friends) tub. Yeah, not sure what else happened with them after, but all I know is later that week we had our family & friends asking where did I get so many & if they could borrow them. Sadly, they were no longer usable thanks to my brother! This time I placed another order for another big even my family was planning & of course everyone loved it. We dried these ones out for future use. PERFECT TOUCH for events on a budget. * It really did fill up 14gals make sure you have help to transport them because it becomes heavy when enlarged.